Lessons authored to work with any version, any application. Save when you purchase It! Series, 3E (Bundle). It! Series, 3E: Spreadsheets will show students how to apply their spreadsheets skills in their own lives. Across over 40 all-new lessons, students will explore the power of spreadsheets as they develop professional documents like sales projections and payroll registers, and encounter relevant topics like school enrollment and budgeting for college. From creating formulas to working with charts and graphs, It! 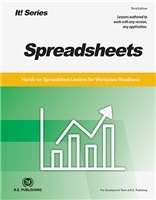 Series, 3E: Spreadsheets is the ideal program for any computer applications course. The Online Instructor Resources for the It! Series, 3E: Spreadsheets include Lesson Answer Keys, Source Files, Grading Rubrics, and Review Worksheets and Assessments. Lesson Source Files offer instructors the option to conserve class time spent keying each lesson's text and data, or to require students to key for additional practice. Review Worksheets and Assessments assess students' knowledge and ask them to demonstrate their spreadsheets skills. Resources for this textbook are housed on our interactive digital eLearning platform, eCTE.com. To save students from using class time to key text, you may decide to provide these files containing the initial text and data required to begin each lesson; alternatively, you may require your students to key for extra practice. Certain lessons require students to insert Project Logos into their spreadsheets. 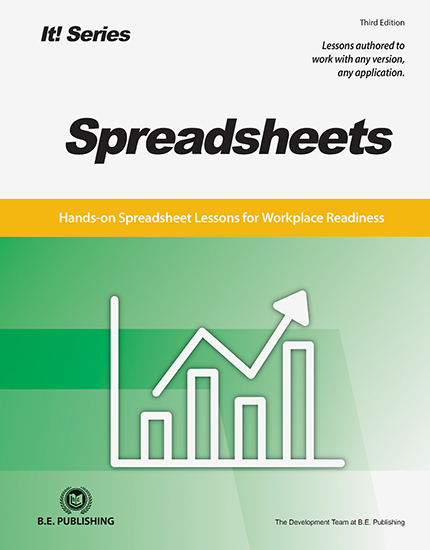 The Review Worksheet measures students' knowledge of spreadsheets from Part 1. Question types include true/false, short answer, and real-world scenarios, in which students use critical thinking to apply what they know to a realistic situation. Assessments measure students' ability to demonstrate the spreadsheets skills in each Part.